Trichoblastoma is a rare benign adnexal tumour. Cribriform trichoblastomas are also called trichoepitheliomas which can be of solitary non-familial type or multiple familial trichoepitheliomas (MFT). Familial type is also known as Brook -Fordyce disease and is an autosomal dominant disease. Here we describe a case who presented with multiple skin colored facial papules and nodules with a history of similar lesions in other family members. Histopathology confirmed the diagnosis of trichoepitheliomas. MFT has been linked to genetic mutations in CYLD gene on chromosome16q12-13 and chromosome 9p. Trichoblastoma is a benign adnexal neoplasm that differentiates toward the trichoblast, i.e., the folliculo- sebaceous- apocrine germ, or follicular germ. There are five types of trichoblastomas i.e. nodular, retiform, cribriform, racemiform, and columnar. Cribriform trichoblastoma is the most common pattern and is another name for trichoepithelioma. Trichoepitheliomas present as solitary non- familial lesion or multiple lesions as a part of autosomal dominant inherited syndrome known as Multiple Familial Trichoepitheliomas (MFT) or Brook -Fordyce disease. Brooke and Fordyce first described inherited multiple trichoepitheliomas in 1892 under the names 'multiple benign cystic epitheliom' and epithelioma adenoids cysticum' respectively. Inherited multiple trichoepitheliomas are also present in Brooke- Spiegler syndrome (BSS) which is also an autosomal dominant inherited syndrome characterized by cylindromas, trichoepitheliomas, and occasional spiradenomas. In a family with Brooke- Spiegler syndrome, some individuals may present with isolated cylindromas or trichoepitheliomas or both may be present in an individual. Herein we report a case of multiple familial trichoepitheliomas. A fifteen year old boy presented with multiple skin colored papulo-nodular lesions located mainly on the central part of the face around nose (Fig1). Lesions started at the age of ten years and continued to appear till date. No other cutaneous lesions were present on other parts of the body. Systemic examination was within normal limits. Skin biopsy was consistent with the clinical diagnosis of trichoepithelioma showing lobules of small, dark basaloid cells, with peripheral palisading surrounding a central area of eosinophilic amorphous material (Fig 2). There was a history of similar lesions in the mother, maternal grandmother and great maternal uncle. The lesions in mother appeared at the age of about sixteen years around her nose and the whole face was involved within two years (Fig 3). There was no other significant history in the mother. Fig 1: Showing multiple centrofacial papulo-nodular lesions in the index case. Fig 2: Histopathology showing lobules of small, dark basaloid cells, with peripheral palisading surrounding a central area of eosinophilic amorphous material (H&E X 40). Fig 3: Showing multiple trichoepitheliomas over face in the mother. There is a genetic heterogeneity of MFT. Initial reports linked MFT to chromosomes 9p21 but recent reports have found mutation in cylindromatosis tumor suppressor gene (CYLD), which maps to chromosome 16q12-q13 in most of cases. Mutation in CYLD gene give rise to MFT indistinguishable from phenotype assigned to 9p21. As Brooke-Spiegler syndrome is also linked to the CYLD gene so MFT is likely to be a phenotypic variant of BSS.7Sporadic forms have been linked to gene at chromosome 9q22.3. In our case similar type of lesions were present in all family members thus it fits well in Brook Fordyce's disease. Treatment is mainly for cosmetic concern. Various treatment modalities which have been tried include surgical excision, chemical cauterization, laser resurfacing, electro-surgery and dermabrasion. Recently, topical 5% imiquimod cream has been advocated as a useful treatment. CYLD encodes a deubiquitinating enzyme that negatively regulates the nuclear factor (NF)-κB by specific tumour necrosis factors (TNFRs). The NF-κB transcription factor plays key role in inflammation, immune response, oncogenesis and protection against apoptosis. Thus inhibition of CYLD increases resistance to apoptosis, which is responsible for tumourogenesis. The same mechanism has been supposed to work while treating MFT, s with adalimumab (a neutralizing antibody to TNF) and aspirin (inhibitor of NF- κB). Thus providing medical therapeutic options in addition to surgical options. To conclude, MFT is a relatively uncommon disease. For patients presenting with multiple centrofacial papules especially with positive family history, a high index of suspicion is needed to make correct diagnosis. 1. Hurt MA, Kaddu S, Kutzner H, Cribier B, Schulz T, Hartschuh W. Benign tumours with follicular differentiation. In: LeBoit PE, Burg G, Weedon D, Alain Sarasin, editors. World Health Organization Classification of Tumours. Pathology and Genetics of Skin Tumours. Lyon: IARC Press; 2006. p. 152-3. 2. Khandpur S, Ramam M. Skin Tumors. In: Valia RG, Valia AR, editors. IADVL Textbook of Dermatology. 3rd ed. Mumbai: Bhalani Publishing House; 2008. p.1504. 3. Pincus LB, McCalmont TH, Neuhaus IM, Kasper R, Oh DH. 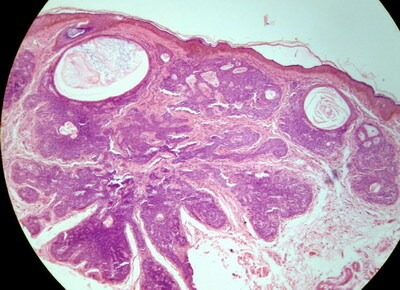 Basal cell carcinomas arising within multiple trichoepitheliomas. J Cutan Pathol 2008; 35: 59- 64. 4. Szepietowski JC, Wasik F, Szybejko-Machaj G, Bieniek A, Schwartz RA. Brooke-Spiegler syndrome. J Eur Acad Dermatol Venereol 2001; 15: 346- 9. 5. Fisher GH, Geronemus RG. Treatment of multiple familial trichoepitheliomas with a combination of aspirin and a neutralizing antibody to tumor necrosis factor alpha: A case report and hypothesis of mechanism. Arch Dermatol 2006; 142: 782- 3. 6. Crotty K, Dutta B, Hogan P. Multiple trichoepitheliomas in a mother and daughter. Australas J Dermatol 2003; 44: 270- 2. 7. Salhi A, Bornholdt D, Oeffner F, Malik S, Heid E, Happle R, etal . Multiple familial trichoepithelioma caused by mutations in the cylindromatosis tumor suppressor gene. Cancer Res 2004; 64: 5113- 7. 8. Lee KH, Kim JE, Cho BK, Kim YC, Park CJ. Malignant transformation of multiple familial trichoepithelioma: case report and literature review. Acta Derm Venereol 2008; 88: 43-6. 9. Johnson H, Robles M, Kamino H, Walters RF, Lee A, Sanchez M. Trichoepithelioma. Dermatol Online J 2008; 14(10): 5. 10. Yiltok SJ, Echejoh GO, Mohammad AM, Ituen AM, Igoche MI, Dades OT. Multiple familial trichoepithelioma: a case report and review of literature. Niger J Clin Pract 2010; 13: 230- 2.